Four years ago, as New York City prepared to elect its first new Mayor in more than a decade, Hispanic Federation published “La Gran Manzana: The Road Ahead for New York City’s Latino Community.” We explained the key challenges facing more than two million Latino New Yorkers and offered a blueprint for addressing those challenges. It was a bold document that combined thorough research and real-world experience to create an agenda to improve the lives of Latino families across our city. Florida’s connections to the Hispanic world are deep, dating back centuries before the founding of the United States. The peninsula has long been home to waves of immigrants and exiles from Spain and Latin America. Not surprisingly, today Florida is home to the third largest Latino population in the country. Nearly 5 million Latinos call the Sunshine State home, and their numbers are growing. 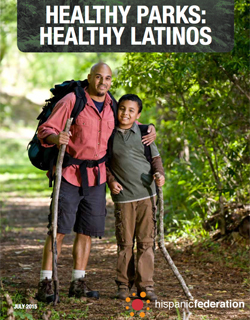 Latinos face a wealth gap that leads to poorer socio-economic outcomes for Latino families. The NHLA proposes a range of policies to close the wealth gap. The NHLA calls for a fair approach to the federal budget that permanently eliminates the arbitrary across-the-board cuts known as sequestration, increases investments in growing our economy, and reforms tax policy to generate greater revenues that can be invested in domestic programs and de cit reduction. Greater investment is needed in workforce training programs – especially for youth and women – as well as English instruction, and the inclusion of community-based organizations in these programs’ implementation. Puerto Rico and its more than 3.5 million residents are in crisis. In June 2015, Puerto Rico’s Governor Alejandro García Padilla declared that the Commonwealth’s $72 billion debt was “not payable.” He further declared that Puerto Rico needed help from the U.S. government and creditors to restructure the debt and create a plan for sustainable economic growth. 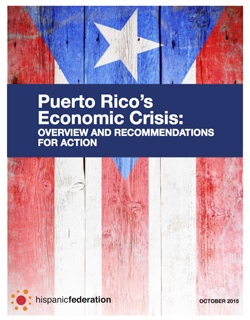 Governor Padilla’s declaration comes after years of low employment and labor participation rates, high rates of outmigration leading to a decline in population, an economic structure shaped more by tax advantages than comparative advantages, inequities in federal health care reimbursement, and unwise, predatory lending practices by hedge funds, which own an estimated 20 percent to 50 percent of Puerto Rico’s debt. The growing concern over rising inequality was a central feature in the 2013 mayoral election in New York City. It was a theme that resonated with many New Yorkers, especially Latinos and Blacks, who have disproportionately felt the negative impact of the city’s deepening economic disparity. However, in the election’s aftermath many questioned the power of the city’s executive to reduce inequality in general and its racial and ethnic dimensions in particular. While concern with unrealistic expectations may be warranted, we believe there is an unprecedented opportunity for the de Blasio administration to work with the New York City Council and other key stakeholders to shift the focus of city policy in the areas of economic development, workforce development and employment in ways that could mitigate, or even reduce, inequality in New York City. Last year Mayor Bill de Blasio ordered all agencies to begin aggressively tackling income inequality. 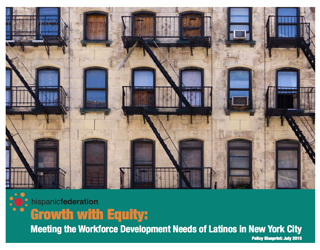 In this spirit, the Hispanic Federation presents its 2015 policy paper Growth with Equity: Meeting the Workforce Development Needs of Latinos in New York City. It is a rethinking of the city’s workforce development services as well as a launching pad for ideas on how to economically uplift Latino and other struggling New Yorkers. 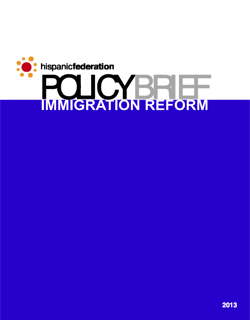 More than 17 percent or 55 million Latinos call the United States home. From east to west coast, New York to California, Latinos live in rural, urban, and suburban areas where they seek to maintain strong ties to nature and the environment. Unfortunately, Latinos are increasingly finding it harder to access and stay in touch with nature. Whether through camping, hiking or playing in a local park, our neighborhoods have not seen the investments needed to give us access to green spaces that most other communities enjoy. The importance of parks to Latino neighborhoods and communities cannot be understated. These green spaces not only contribute to the beautification and air quality of our cities and towns, but also provide space for informal community convening and facilitate neighborly connections that may otherwise go unmade. Moreover, parks make a direct economic impact to our neighborhoods in the form of greater real estate values and commercial contributions from local residents and visitors. Most importantly, investing in parks is a commitment to building community cohesion, pride and the overall quality life for Latino families and all Americans. 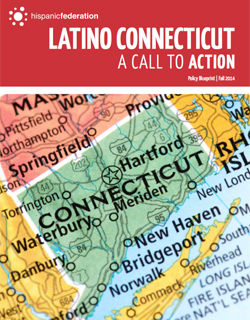 Latino Connecticut puts forth an agenda that calls us to action. For the more than 500,000 Hispanics who call Connecticut home, these are exciting and challenging times. The state is undergoing a dramatic demographic transformation that is making it one of the most diverse places in the Northeast. Connecticut’s Hispanic population grew by more than 50 percent between 2000 and 2012 and the state now ranks 17th in the nation in total Hispanic inhabitants. While most Connecticut Latinos live in Fairfield, Hartford and New Haven counties, other counties such as Middlesex, New London and Litchfield have experienced significant increases in their Hispanic population. In short, everywhere one looks in the Constitution State, the number of Latinos is growing. 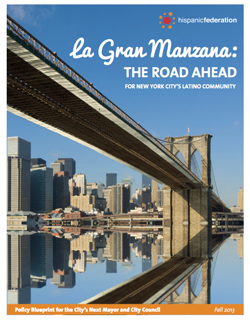 As the youngest and fastest growing community in New York City, Latinos represent in many ways the hope and promise of La Gran Manzana (The Big Apple). However, the continuing failure of our educational system to prepare Latino youth for college success threatens the future prosperity of the Latino community and New York City as a whole. According to Lumina Foundation, just 23 percent of Latino New Yorkers between 25 and 64 years old had at least a two-year college degree, compared to 52 percent of whites. This educational gap is startling and requires immediate action. 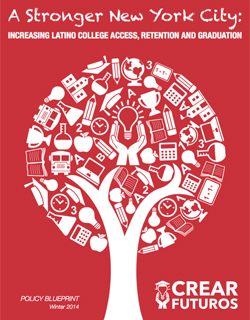 In response to this crisis, Hispanic Federation (HF) and the City University of New York (CUNY) have partnered with community-based and education non-profits, educators, public policy stakeholders and business leaders to launch the Latino CREAR (College Readiness, Access and Retention) Coalition. The Coalition is focused on promoting and advancing policies and practices that improve Latino educational equity and access, and lead to college success. CREAR represents an investment in the future of Latinos and New York City. 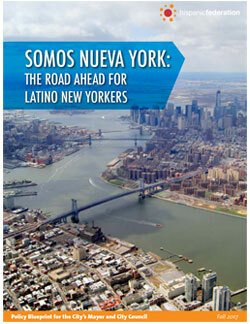 Latinos are changing the New York Region.1 Their influence is being felt in politics, culture and the economy. They are transforming neighborhoods, altering political campaigns, and changing the way businesses do business. Hispanic Federation has not only watched the Hispanic community’s growth and development in the New York Region, it has been a leader in explaining the “how” and “why” of this movement. For this reason we are delighted to present this report on some of the key factors driving the Latinization of the New York Region. Thanks to our collaborators at Nielsen we have been able to create a unique snapshot of the area’s Latino communities. 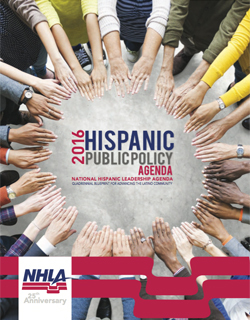 This report was developed using current data on demographics and consumer behaviors in order to shed light on the burgeoning strength of Latinos and their unique position in the consumer landscape. 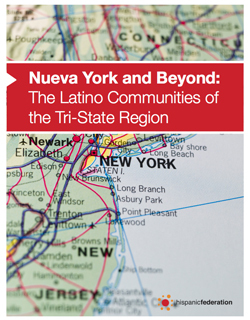 Because the data is so rich and the insights so penetrating, we believe we have created a document that captures the complexity and diversity of the New York Region’s Latinos in a way that few others have. More than 2.3 million Latinos call New York City home. They live in every borough and every neighborhood in the city: from Jackson Heights to Washington Heights, from Parkchester to Port Richmond, from Sunset Park to Bedford Park. Over the course of several decades they have rebuilt communities, opened new businesses, changed the way we eat and speak, and become integral parts of the fabric of New York City. Now, more than ever before, you are as likely to hear New York City described not as the Big Apple but as La Gran Manna. Because Latinos now occupy such an important role in the daily life of the city, it is important that our political leadership understand and respond to the manifold challenges facing our community. This is an election year in New York and one that promises significant changes to the political landscape. Not only will we welcome new members of the City Council but also a new Comptroller, a new Public Advocate, and perhaps most significantly, a new Mayor. As we have watched the electoral process unfold we have been heartened by the amount of attention that the candidates have been paying to Latino voters. But we worry also that while candidates may recognize the value of the Latino electorate, they may not fully grasp the scope of the challenges that Latino families, businesses and seniors face in New York City. 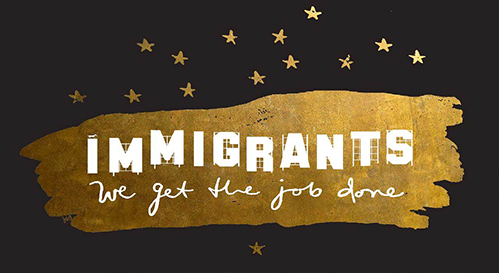 We proudly proclaim America to be a “nation of immigrants.” Throughout our history, the U.S. has drawn people from all over the world to forge new lives, start and support families, and pursue their dreams. Currently, about 40 million immigrants make up 13% of the U.S. population. Then as now, immigration serves as a key force sustaining and driving America’s success. Immigrants have become essential workers in such diverse fields as construction, restaurants and hospitality, IT and health care. Some of the states widely considered to be U.S. “economic engines” — California, New York, Texas, New Jersey and Florida — are among the top five states with the largest number of immigrants. The Small Business Administration (SBA) states that immigrants are 30 percent more likely to start businesses than non-immigrants. These businesses created home-grown jobs for an estimated 4.7 million American workers in 2007.